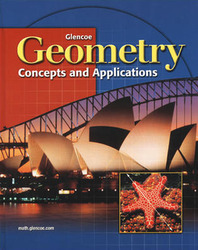 Chapters 1-14 offer comprehensive coverage of geometric concepts without the rigor of proof. Chapter 15 deals with formal proof. Reading Geometry; Words, Symbols, and Models and Communicating Mathematics help your students become proficient in reading geometry. InfoGraphics convey information visually, reducing the student's reading load. Glencoe's Assessment Advantage includes Preparing for Standardized Tests, created in conjunction with The Princeton Review. Two-page reviews present strategies for solving problems that appear on standardized tests and proficiency tests. Each exercise also ends with at Standardized Test Practice problem. Investigation: To Grandmother's House We Go! Investigation: When Does a Circle Become a Line? Investigation: Linguine Triangles? Hold the Sauce! Investigation: Go Fly a Kite! Investigation: Are Golden Triangles Expensive? Investigation: How About That Pythagoras! Investigation: A Locus Is Not a Grasshopper! Investigations: A Locus Is Not a Grasshopper!